The sculpture depicts two species of Stingray, Guuwerr (the bronze stingray) and Tupmul (the aluminium stingray). While out fishing or diving they would be observed, at certain times, leaping out of the water. This action of the stingray is an indicator of an imminent change in weather conditions. When observed during times of rough weather (Muturuka) it indicates a change to calm conditions. The action of the stingrays represents a spiritual connection between these sea creatures and man. In the moment the stingrays are airborne and before the flop back to the surface of the water, islanders of a particular totem will instinctly utter the word, Gubaka. Traditionally Gubaka was the preserve of the person of the Tupmul Augad (totem) who was one of several men representing other island totems who sat in the Kwod (the Western equivalent of a parliament). Tupmul is the artist's totem and is one of the main totems on his island of Badu. 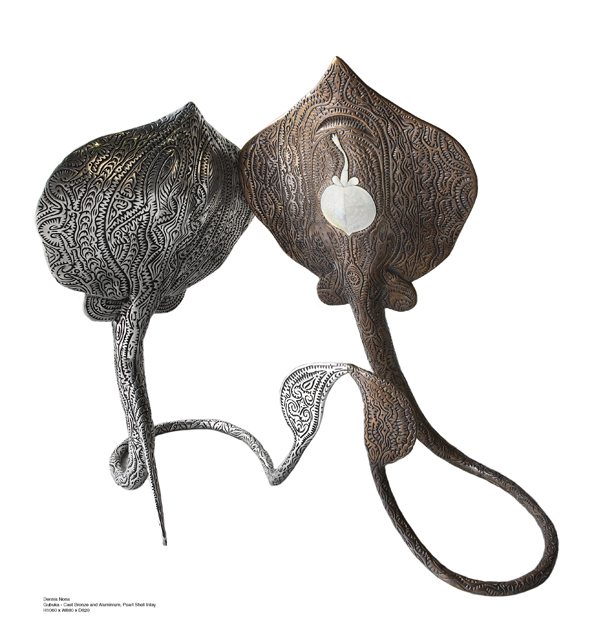 The two different metals used in the sculpture reflect the different colours of the two stingray species: Tupmul is pale white in colour; while Guuwerr is a darkish brown. In creating the sculpture the artist has reflected on the synchronicity or affinity that exists between the sea creature and the man that possesses its totem.